Certified YogaBellies Teacher, Suzanne Goddard shared with The Guardian Business newspaper about how joining YogaBellies gave her the chance to start her own career and balance worklife with raising a family. “Just over a year ago my life looked pretty similar to many other full-time working parents out there. I had two children of five and under, a home to look after and a husband who sometimes felt more like a co-survivor of chaos. I knew it wouldn’t be long before I had to admit to myself that something had to change. I couldn’t have it all and, if this is what having it all was like, I didn’t want it. I loved my job working as a manager of a children’s day nursery and had worked hard to develop my career after having children. I was good at it. However, there was always a compromise to be made. Missing parent assemblies at school, or my son crying on a cold dark morning as I bundled him into the car because mummy had to be at work before 7am. Most importantly for me, though, was the agreement requiring only an annual teaching fee rather than having to pay a percentage of earnings every month, which is not always the case with other franchises. I found the main benefit of joining a franchise was the existing brand awareness, extensive marketing material and ideas already available. I also received comprehensive class plans as part of my training notes, that were already tried and tested, allowing me to concentrate on developing local contacts, marketing my classes and simply to start teaching. Even though teachers are spread throughout the UK, we are encouraged to be on hand for support through an online forum. Nine months later I was fully qualified and ready to start teaching. The training and continuous study has provided me with that crucial knowledge, as well as a sense of personal development. I thought I would have to give that up when saying goodbye to my full-time, highly skilled job. I realise now that I have the best of both worlds: I am able to choose my own working hours, when I go on holiday and, most importantly, I am able to put time aside to make that all-important harvest festival celebration at school. It was important to me to have social interaction through work, and that is why my franchise works so well – I am not simply working from home or “running my own business” but, instead, I am involved in the local community, meeting women from all walks of life, cuddling babies and, best of all, getting amazing satisfaction in being part of a support network for new mums and mums-to-be. Of course, I did have to discover how to be successfully self-employed. I have learned some very valuable lessons along the way. It was very tempting to throw caution to the wind, embrace my new found “freedom” and, with that, have no routine or set plan for my working day. However, being self-employed does require discipline, and a work-day routine is crucial. I ensure that I write to-do lists, follow a detailed business plan and remain organised. Working for yourself requires hard work and dedication, as well as a certain amount of self-motivation to develop your business. However, with a great support network in other teachers and working mum forums, this needn’t be as daunting as it sounds. 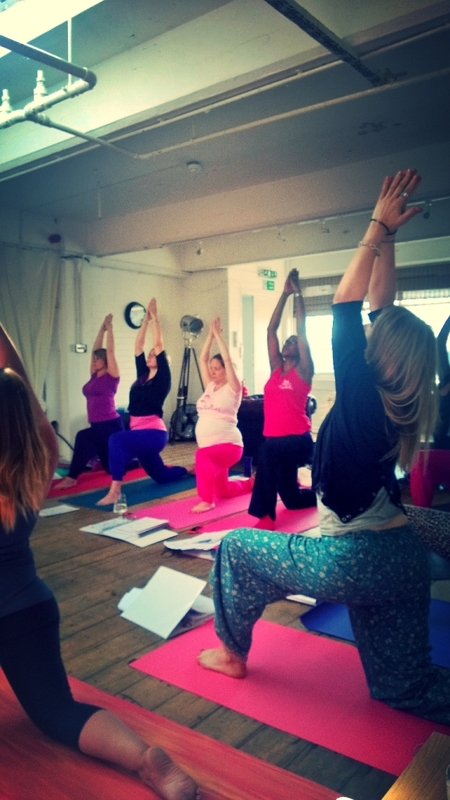 To find out more about becoming a YogaBellies teacher just fill in our enquiry form here.